When you are completing your woodworking tasks, there are a variety of times that a dust mask will come in handy. It can protect you from sawdust particles as you cut and VOCs as you varnish and stain. 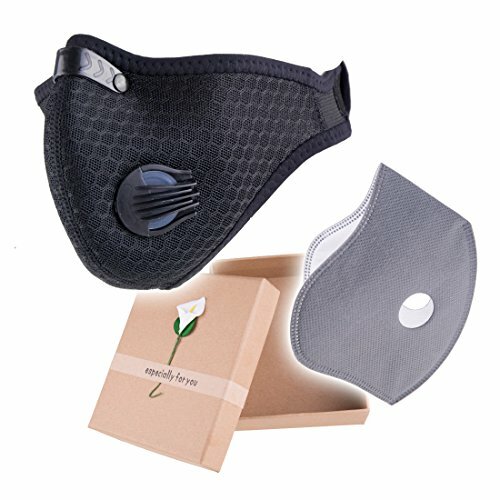 ​Making sure you have the best dust mask for woodworking ensures you have the necessary protection, while also being comfortable at the same time. Consider one of these mask types to protect you from the dangers of sawdust and wood dust. When we were looking for the​ best respirator for woodworking, we found these five models. In our opinion, we think they provide the best options for protection against fumes and particulates. We reviewed them here to make your decision that much easier. Read on to find out a little more about these masks that are specifically designed to stop sawdust, and which one we ​found was the best. The air mesh design of the ​PonKing Mask provides a breathable fabric that you’ll feel comfortable wearing for extended periods of time. This mask is also ergonomic in its development, allowing a proper fit and good protection with a lightweight 0.13 lb. structure. It is ideal for woodworking applications and includes an activated carbon filter. The dust mask is moisture proof and resistant to dust, bacteria, wood grains, and fog. It is rated for the removal of particles that are 2.5 microns. It is also NIOSH N95 approved. ​The PonKing dus​t mask also comes with an extra filter for replacement, giving you extended wear of the mask. Plus, PonKing offers a money back satisfaction guarantee. If, for any reason, you are unhappy with the mask, you can return it for a full refund. While we were impressed with the design and capabilities of the PonKing mask, we did find some drawbacks you might want to consider. Th​is mask cannot be washed as it will reduce the effectiveness of the product. You can change the filters. We also found that at the current time, PonKing does not offer replacement filters for the mask. However, it does come with an extra one so you will get plenty of life out of the mask. The ​RooRuns Dustproof Mask is a very capable product. It eliminates as much as 95 percent of dust, chemicals, fumes, and particulates, making it perfect for a woodworking application. Because the dust mask has an active carbon filter, it traps these pollutants and isolates them from reaching your nose, mouth, and other areas. RooRuns has used an ergonomic design to provide a proper fit, which is complemented by an adjustable Velcro strap. ​This​ mask stays put all the while you work as it has an adjustable aluminum sheet within its design around the bridge of the nose. The mask, itself, weighs a total of 52 g and can be washed. Filters are replaceable, and it is recommended by the manufacturer that this occurs every three months. We were pleased with the overall design of the RooRuns ​mask, but did find a drawback we wanted to make sure you were aware of. Some consumers found the mask did not perform well with sawdust. Some dust particles were able to penetrate the mask, but other consumers found the mask worked without this issue. This may depend on your sensitivity to dust particles. Overall, we found this dust mask performed as intended. 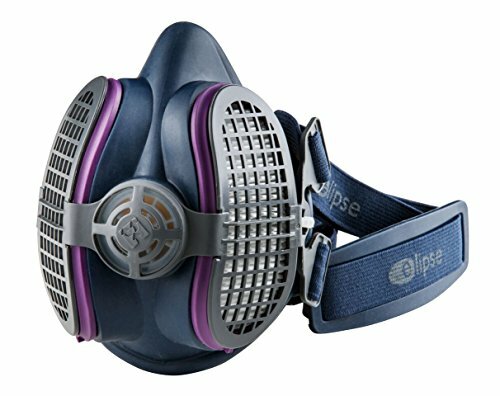 ​The ​GVS SPR457 Elipse P100 Half Mask Respirator provides even more protection as you perform your woodworking projects. This mask is made from thermoplastic elastomer and weights in at only 6.4 ounces. It has a compact footprint and uses a flexible design that is comfortable to wear. ​​You’ll appreciate that this ​mask fits well on the face while still providing a good line of sight. You can wear this ​protection mask with eye or ear protection without feeling cumbersome. ​It also features a non-return valve that helps adjust your breathing resistance, so you are never struggling for breath or allowing moisture inside the mask. The only drawback we saw on the Elipse mask is the filters on the mask are not carbon activated. This may limit its effectiveness in some applications. We found for woodworking projects the ​GVS SPR457 Elipse Half Mask was a very functional dust mask. 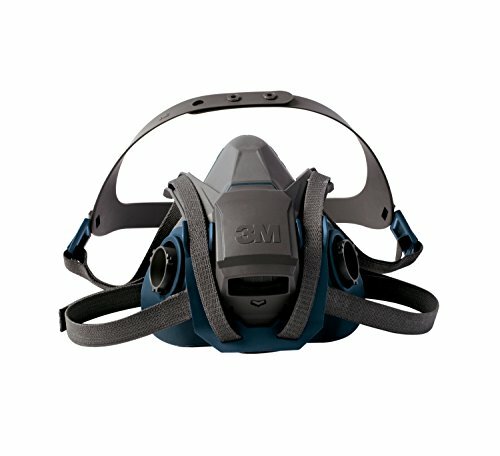 ​Also, on our list of dust masks is the ​3M Reusable Respirator 6501QL/49488. This respirator allows for use in a variety of applications including woodworking. The mask has a silicone face seal. This provides a comfortable fit around the mouth and nose to offer plenty of protection as you work. Fit is also aided by the quick latch mechanism that allows you to drop the mask off your face without having to completely remove it from your head. ​Heat and moisture build up in the dust mask are managed by a Cool Flow valve. 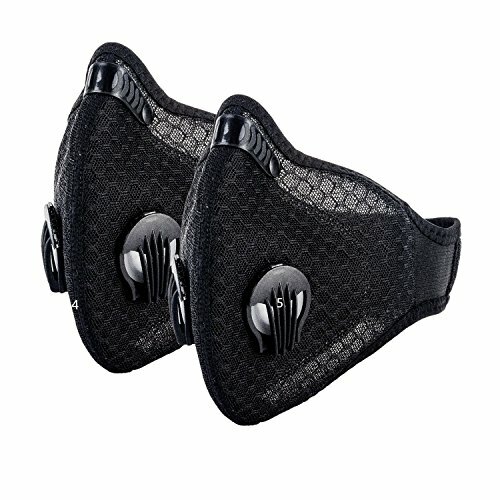 This allows you to breathe easier and is more comfortable as you wear the mask. The design of the dust respirator mask incorporates a low-profile design that provides plenty of viewing capabilities. You can easily wear this mask with a grinding or welding shield without discomfort. The 3M Reusable 6501QL/49488 ​also has a 3.2-ounce weight and provides protection against airborne contaminants. It has an integrated filtration system that uses both filters and cartridges for cleaning. It is designed to protect up to 10 times allowable permissible exposure limits. It is NIOSH approved. This mask offers plenty of protection against fumes and particulates. But, it doesn’t come with the actual filters you need to use the device. You need to order the filters and cartridges separately. This does allow you to customize your mask to the application you will be working in most frequently. ​The ​Krisvie Activated Carbon Dustproof Mask utilizes an innovative design that uses a variety of holes to make it as breathable as possible. This is further aided by an adjustable double air-breathing valve to prevent resistance as you breathe. It makes for smooth breathing all the while you are wearing the mask. Fortunately, this mask and respirator can be washed if it were to get dirty. Two filters provide plenty of filtration. These filters are carbon-activated for added protection against your work elements. They can also be replaced over time when they are past their usable life. ​This mask offers an adjustable elastic strap. A fitted nose bridge clip prevents slippage. It can also be molded to your facial features for a custom fit. Plus, it comes in four colors. Krisvie offers a 100 percent money back guarantee of the product. You can return it if for any reason you are unhappy with its performance. The Krisvie Activated Carbon Dustproof mask is compact as well as lightweight. It is rated for protection against dust, bacteria, fog, and wood grain all the way down to 2.5 microns. It also features moisture resistance, so you never have to worry about wetness, heat, or fogging. We found the Krisvie mask to be a very versatile filter. There is one drawback we wanted to inform you about. This ​protection mask is not necessarily designed to fit all face types. A large face may find this mask difficult to wear, but it can be custom molded as needed to fit. In the end, it was a tough decision for us to pick between the Elipse and 3M, but we give our vote to the ​GVS SPR457 Elipse P100 Half Mask Respirator as the best dust mask for woodworking. One of the main reasons is how comfortable the mask is. Typically, these types of masks are uncomfortable and annoying, and Elipse solves that. It is NIOSH certified and comes with everything you need, including replacement parts. When you are choosing the a mask for your woodworking, there are several things you need to consider before you buy. A simple mask just won’t provide you the level of protection you are looking for. You need some durability from the waste products you are producing, so you can ensure you are safe while you work. Keep these factors in mind when you are looking for a woodworking mask or woodworking respirator. The material of your mask should be breathable. You should not struggle to breathe or have laborious breathing with the mask on. Mesh is a popular choice for sawdust masks that works well as a breathable option. It can provide the comfort and security you need to ensure you don’t gasp for air or become incapacitated in any way when wearing the mask. Comfort is one of the most important factors that a mask for woodworking can provide. Because you will be wearing this protector for extended periods of times, you want it to feel lightweight and comfortable on your face. It shouldn’t be tight or pinch in any way. You need a good seal around your ​mouth and nose, and it should not be restrictive on your face. Like comfort, how a respirator mask fits can determine if is it is the right one for you. You need to protect both your nose and mouth from woodworking byproducts. If your mask does not securely protect both of these, it may not be the right size or fit. It should securely fasten around your head and not slip or gap as you move. It should also not slide off your face, and it should provide easy viewing capabilities. Some ​of these come as a mask respirator with additional protective features. These masks weigh more than a traditional dust mask. But, they offer additional features, such as filtration, that can provide more protection from fumes and exhaust. Even though these masks tend to weigh more, you can find one that is lightweight and comfortable on your face. The material that some dust blockers are made of can be washed. This offers you the ability to ensure you have a clean mask each time you wear it. You’ll also be able to remove dirt and grime that can build up over time, giving you a clean and fresh mask to wear at all times. Some masks, such as an asbestos dust mask ,come with filters that can be changed out as they get full of dirt, dust, and debris. These filters typically have carbon that reduces the penetration of particles as you breathe through the mask. Filtration is probably the #1 reason you're picking up a good mask for woodworking. Sawdust, drywall dust... these fine particles can work their way through even some poorly constructed masks. Pay attention of how the mask filters, because it is the most important item. It is also best to choose a sawdust mask that is NIOSH approved. This will give you an added level of security. You are assured it is rated to the standards of the National Institute of Occupational Safety and Health. While some masks may claim to remove particles to certain levels, without the proper certification and approval, there is no way to be sure. Always check that your mask is certified by NIOSH. The same way that dust accumulates in a certain unattended corner of your house, it can also make a home out of your lungs and clog it up. If you're constantly exposed to dust, specifically in woodworking, excessive inhalation of the particles can be extremely hazardous to your health in the long run. If there's a simple way to prevent unwanted future ailments, it's ​using a mask. ​​A mask designed to protect against dust is defined as ​"a flexible pad held over the nose and mouth by elastic or rubber straps to protect against dusts encountered during construction or cleaning activities,” according to Wikipedia. If other words are omitted or changed, the same description can be used for other types of masks such as paint masks, surgical masks, gas masks, and even respirators. Though all are worn the same way, each of them serve a different function and prevents different types of pollutants from being ingested. It's important to distinguish between them to really understand the purpose of a dust blocking mask. Some masks, like the surgical mask, don't protect against dust or anything at all. Its function is about catching any bacteria in the form of liquid or aerosol from the health professionals' mouth and nose during a surgical procedure. The paint mask or gas mask protect from certain air-borne chemicals or vapors that might be poisonous to a person. A respirator is probably the closest thing to a dust mask in terms of function, only more extensive. It can act as a filtering device that prevents any airborne pollutants and contaminants from being inhaled. The latter is also a kind of respirator – particulate respirator – though it offers protection only against some particles. They're made with a filtering material that resemble the composition of cloth. Dust-stopping masks fall under the category of “air purifying respirators” because they function as a filter, cleaning out the air and blocking small particles from passing through the cloth-like material. It makes breathing safer in an area where woodworking is done. The flexible pad of masks are usually curved to cover all around the wearer's mouth and nose, at least half of the face where they can unconsciously inhale or ingest small particles. Like other masks, a dust mask is worn around the head with an elastic strap that goes to the back of the head. Not all masks are made the same though. Some disposable ones will have only one strap. Others have two, one on the upper part of the head and the other on the lower. Other advanced features in some masks are the aluminum strip on the exterior on top of the bridge of the nose. Under it, a strip of foam rubber usually sits inside right on the skin. The aluminum strip can be bent to match the face of the wearer more. It helps to achieve a more accurate fit. Even if it ends up not fitting so well, the foam rubber strip inside is a kind of seal that sticks the mask to your nose. ​These masks specifically pose a bigger possibility of an improper fit, so it's important to know how to wear it correctly for it to perform its purpose well. The way you know it's put on correctly is when you can see the aluminum strip on either sides of the nose. It's the first of three key factors posed by NIOSH for effective respiratory protection within the workplace or personal use. The other two are that these masks ​are to be worn during the entirety of the exposure to non poisonous particles, and that it should filter out at least 95 percent of particles that comes across the material. The use of ​these masks at work must follow the guidelines and protocols imposed in OSHA's 1910.134 respiratory protection standard. If possible, the safest masks to use are the ones approved by NIOSH. All NIOSH-approved masks are labeled as such. If not that, there should be a large N95 label on the mask itself. In the professional landscape, employers are tasked to train their employees on how and when to use these types of masks. Proper use and wear are also usually administrated by a safety professional. For the general public, the same kind of dust mask as for professionals are recommended. Other apparatus used for this purpose like bandanas or t-shirts put over the mouth and nose don't work the same way as these NIOSH-approved masks. Eric Meier says, “the biggest threat to a woodworker comes not in the form of bodily injury from a power tool, but from wood dust.” Invisible fine dust or “coarse inhalable particles”, which are only between 2 to 10 microns, continue to be suspended in the air even after the work has been done. According to the Occupational Safety and Health Administration, there should only be a maximum of 1 milligram per cubic meter for hardwoods and 5 milligram per cubic meter for softwoods in a wood shop. That amount is almost impossible especially when tools like routers, band saws, and sanding are used. The most immediate effects of wood dust is because they are naturally irritants. People who come in contact with it are usually met with some problems in the eyes, nose, and skin. Sneezing, itching, rashes, and breathing problems are some of the common reactions, especially to those who are not used to it. Some wood workers may be more sensitized to it from frequent exposure to it. However, the lack of immediate physical reactions isn't always a good sign because it's usually building up a much severe problem. Eventually, it might result to boils or inflammation of the lungs. When you look through the Wood Allergen and Toxicity database, you can see that a few species of wood are considered toxic. Though these are few and rare, the toxic quality of some types of wood can possibly cause fatal effects. The International Agency for Research on Cancer (IARC) and American Conference of Governmental Industrial Hygienists (ACGIH) have identified some types of dust like saw dust as a group A carcinogen. The US Environmental Protection Agency's Integrated Risk Information System (IRIS) database, which follows the same rating system as IARC in identifying the harming degree of a substance, identifies group A substances as carcinogenic, or could cause cancer, to humans. This confirms that some wood species can cause nasopharyngeal carcinoma or nasopharyngeal cancer. It's all the more reason to ​use a protective masks every time you work with wood. Government regulations should be enough reason to wear these masks, and wear them properly when necessary. However, health risks for your own sake are a greater motivation to do so, and there are many as ​explained. You don't normally detect the effects of frequent and excessive exposure to dust, especially when working with wood, until years later but it doesn't mean it's not damaging your insides now. Dust masks are not the surest type of masks but their effectiveness is unquestionable when worn as intended. After reviewing these masks, we found the ​GVS SPR457 Elipse Mask & Respirator was the perfect choice for woodworking projects. We liked that it came with a filtration system as well as extra filters. We found this was the top dust filtering mask to protect you from both sawdust and VOC fumes. We also liked that it was NIOSH approved. You won’t go wrong buying the Elipse - it protects and fits like it should, making it our top choice ​on the market.